Many tales are told by the fishermen of Greece, and Professor Tony Ephremides (ECE/ISR) has his own to share. 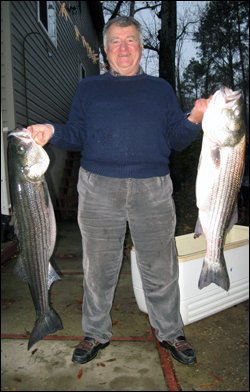 Tony recently caught these giant rockfish in the Chesapeake Bay. Each fish weighs about 20 lbs. And just in case Tony's run out of ways to prepare his catch, we offer a recipe for his Maryland state fish.